Republican Governor Mike Pence was declared the resounding winner of the first and only vice presidential debate on Tuesday night, according to polling taken live during the matchup on AOL.com. The GOP nominee for vice president was declared the winner by 54 percent of respondents, compared to only 46 percent who voted for Tim Kaine in the flash poll. VOTE NOW: Who do you think won the vice presidential debate? Clinton's running mate was behind Pence for the majority of the 90-minute debate, at one point by nearly 15 points, but his deficit shrunk as the event ended. More than 1000 people voted in the flash poll, which did not take a scientific sample. 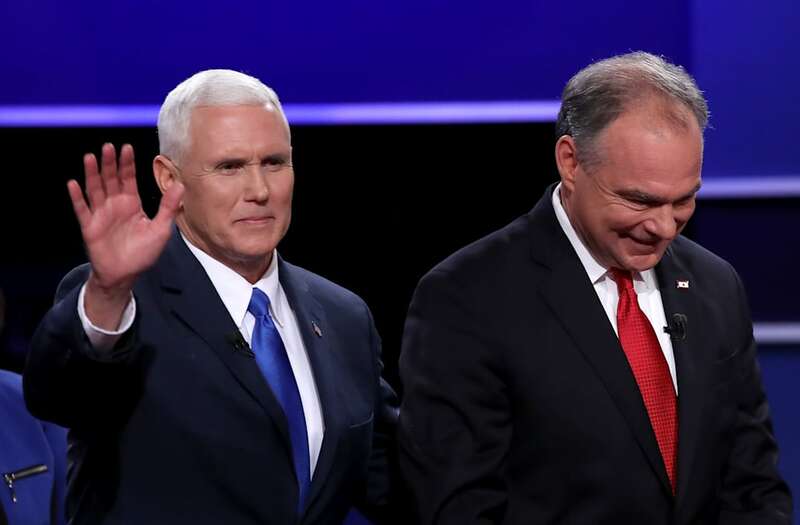 In a separate poll run after the debate ended, Pence held a similar eight-point margin over his Democratic rival an hour after the debate had ended. So far, Kaine is interrupting as much as Trump did in his debate. On Twitter, many criticized Kaine for interrupting Pence too often during the debate. Donald Trump cheered his running mate on during the face-off on Twitter, praising him for "dominating" and saying he "won big" shortly after it ended. Hillary Clinton's campaign also defended her nominee's performance on Twitter as well, saying how proud she was of Kaine and rallying supporters. But her campaign also acknowledged he may not have been the clear winner on style at a minimum when the account retweeted a line from a reporter stating "There's no doubt that Pence is a great performer," which also alleged Pence "lied about everything his running mate said." Trump and Clinton will go head-to-head once again in only four days, as the two debate for the second time in St. Louis, Missouri on Sunday, October 9. Want to make your voice heard? Vote now for the VP nominee you think won the debate.